ISS Expedition 11 commander Sergei Krikalev and flight engineer John Phillips now have the space station to themselves after seeing off the outpost's previous occupants - the Expedition 10 crew's Leroy Chiao and Salizhan Sharipov - Sunday. The two men are now in the beginning of what promises to be a busy six months aboard the ISS. "It's very exciting to be here," Krikalev said shortly after arriving at the ISS on April 16. "The main goal of each expedition, not just ours...is to continue flying." Two seems to be the lucky number for the Expedition 11 crew. The men are expected to be the last two-person mission to the ISS, they will perform at least two spacewalks during their mission and receive two unmanned Progress supply ships. Finally, if NASA officials hit their launch targets this summer, the Expedition 11 crew will host the first two space shuttles to dock at the space station since the orbiter fleet was grounded following the loss of Columbia in 2003. "We're really looking to getting back to something like [launching shuttles] every six weeks or so," Phillips said. "And we know that's going to be a challenge." The first shuttle flight, NASA's STS-114 mission aboard the Discovery orbiter, is expected to launch no earlier than May 22. Unlike Phillips, Krikalev is no stranger to long-duration spaceflight. Born in what is now St. Petersburg, Russia, Krikalev has been a cosmonaut since 1985 and has served aboard long-duration missions to the Mir space station, as well as the ISS as part of Expedition 1. He also flew aboard a NASA space shuttle on STS-60 on the first joint U.S.-Russian mission. "I feel like I'm back home," Krikalev told a reporter after reaching the ISS. "Though a lot of things have been added to the station." Krikalev is the only Russian cosmonaut to have launched into space six times and by the end of Expedition 11 he will have amassed 800 days of living in space, more than any other human being on or off the planet. "It might be an important step in the big picture but for myself, every day of my life is important," Krikalev said soon after arriving on station. "So it is just a result of regular, daily work on the station." In addition to his role as Expedition 11 flight engineer, Phillips also serves as NASA's dedicated science officer during his time aboard the ISS. Hailing from Scottsdale, Arizona, Phillip, a father of two, has been to the ISS once before when he served as ascent/entry flight engineer and intravehicular activity coordinator aboard the Endeavour orbiter during STS-100, which delivered the Canadarm-2 robotic arm to the ISS. But while he looks forward to making his first spacewalks during Expedition 11, it is the science program he anticipates most." The status of the station is that it's in good shape," Phillips said. "It's more crowded than it was when I was here because there's a lot more lab equipment and a lot more supplies." Phillips anticipates that the arrival of Discovery, and the new life sciences equipment aboard its cargo module, this May will be a bounty for the ISS science program. "For me as a scientist, anytime you get new stuff in your lab, it's really exciting," he said. "And I'm told that the second shuttle to arrive, the STS-121 flight [aboard the Atlantis orbiter] will carry a heavier payload of scientific material." Phillips also said that Atlantis -- currently slated to arrive sometime in mid-July -- may also deliver German astronaut Thomas Reiter, of the European Space Agency (ESA), as the third crewmember to the ISS though the decision is not yet official. "What that means to us is it frees up a lot of time," Phillips said. "A large part of that third person goes to research time." While the Expedition 11 crews currently have the space station to themselves, it wasn't so during the Soyuz flight to the orbital laboratory. Riding alongside Krikalev and Phillips then was Italian astronaut Roberto Vittori, representing ESA, flying his own Eneide mission of science to the ISS. The mission marked his second trip to the space station following a Soyuz taxi flight in 2002. He landed with the Expedition 10 crew on April 24. 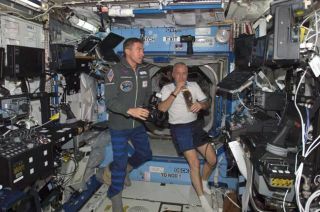 "It's an honor to fly on the International Space Station (ISS)," Vittori said at the start of his brief space station stay. Vittori spent eight of his 10 days in space conducting a wide range of scientific experiments, including studies into the functions of proteins in the brain and eye movement during spaceflight. Other tests were conducted in cooperation with schools, such as a seed germination experiment that will be compared with seeds germinated in classrooms on the ground. A native of Viterbo, Italy and father of three, Vittori conceded that he would not have much idle time aboard the ISS during his brief stay. But when he did find a free space, he planned to watch Earth from a window, he told SPACE.com in a prelaunch interview. In addition to the more academic experiments on his regime, Vittori also brought a variety of Italian food dishes to test at mealtimes during his flight. He kept a detailed log of the activity for use in developing future flight menus. The results of that experiment, and the rest of his Eneide science program, will be available after he returns home to Earth.